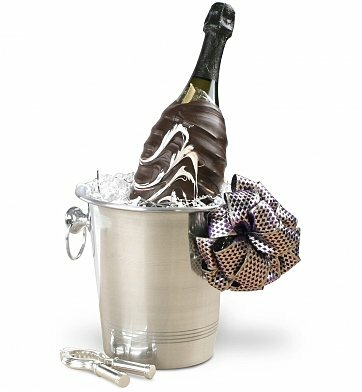 This unique champagne gift features a striking flared champagne chiller and silver-plated pliers -- and a very special bottle of champagne dipped in world-famous Guittard white and dark chocolate, in an elegant marble blend. One Bottle of Dom Perignon Champagne or Nicolas Feuillatte Brut Champagne, each hand-dipped in rich gourmet chocolate. The world renowned Champagne produced from only the finest grapes. Powerful, chiseled, and timeless, with notes of almond, powered cocoa, white fruit and hints of dried flowers. Pale yellow, brilliant and crystal clear, Nicolas Feuillatte Brut hints aromas of apple, pear, peach and exotic spices. On the palate it is elegant and complex, a delicate bead imparts freshness on the finish. Champagne Luxury is a hand delivered gift. These gifts are delivered by one of our local design centers located throughout the United States and Canada. Same day delivery is available for most gifts when ordered before the cutoff time. The cutoff time for Champagne Luxury is 12 PM in the recipient's time zone. Ribbon zipper to release the chocolate jacket from the bottle. Will arrive beautifully wrapped in a gold organza bottle bag. Overnight shipping is suggested for warm weather delivery destinations. Arrives in a compact box. Well packed too. Luxurious gift for my sister-in-law. Perfect gift for those who are a little more "refined." Customer Service is also AMAZING. Sent this as an anniversary gift and it was a hit! They had never seen this before and were thrilled with it. great present for girls, looks posh! whats more important is that i use gifttree for the second time and the delivery is right on time, thanx for perfect timing!